Female Wave of Change is very excited to welcome Shashi Goel as our Ambassador in Wisconsin. Great to see the team in the USA growing! Shashi Goel is specialized in Political Science and Women’s and Gender studies. She has done research in many areas in Political Sociology, International Relations, Women’s studies and Human Rights, Migration. She is currently working as Honorary Fellow in the Center for Women and Gender studies at University of Wisconsin. Previously she has worked as a visiting faculty at Qatar University. 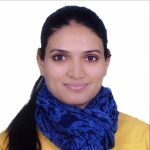 She was awarded by Indian Council Historical Research (ICHR) for her PhD work and later in continuity she got a prestigious award by Indian Council of Social Science Research (ICSSR) for her work on Gender Budgeting and her Post Doctorate work. She published many Research Articles and book chapters. She has published a book on Domestic Violence Against Women. She is currently working on Gender budgeting book and doing research on women empowerment and household shares. She is very active in Development and academic field as well. She has joined many international organizations like WILPF as a member. She sees these platforms as a tool to connect with grassroots people and similar mind people who are really devoted and interested to work on similar path. She believes in this Motto that: “Every human has a right to live a dignified and free life. So they can access their full potential for that they require a Peaceful and Free Society, Nation and World”.